Last week, when President Obama made his trip to Bagram Air Base in Afghanistan, he claimed that "America's war in Afghanistan will come to a responsible end." This turned out to be the greatest applause line of his speech. With his assertion, Obama, in effect, declared himself the hero of the Afghan war -- the one who put an end to that nightmare. But what Obama failed to mention was that it was his war, and that nothing but unattractive scenarios lie ahead for that war-torn state. Indeed, Afghanistan might just continue to hold down its ranking as the most violent country in the Global Peace Index. This gloomy prognosis would not have surprised Thomas Jefferson. Yes, Jefferson's words point to a fundamental truth, "Governments constantly choose between telling lies and fighting wars, with the end result always being the same. One will always lead to the other." Graciana del Castillo, one of the world's leading experts on failed states, has just written a most edifying book on the Afghan war (Guilty Party: The International Community in Afghanistan. Xlibris, 2014). Del Castillo's book allows us to finally understand just what a fiasco the Afghan war has been. Why is Afghanistan, as Bob Woodward correctly termed it, Obama's war? 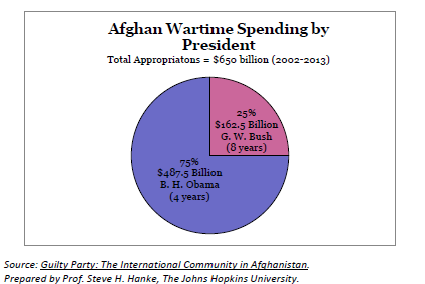 Del Castillo's sharp pencil work shows that during the period 2002-2013, $650 billion have been appropriated for the Afghan war effort, and a whopping $487.5 billion of that (or 75 percent) took place after President Obama took office (see accompanying chart). If one pulls apart that $650 billion price tag, a variety of interesting sleights-of-hand emerge. For example, about $70 billion was disbursed to what is euphemistically termed "reconstruction." But, in reality, 60 percent of this $70 billion (or $42 billion) was actually spent on beefing up the Afghan National Security Forces. And not surprisingly, 75 percent of the $42 billion spent on national security forces was spent under President Obama's watchful eye. To put these outsized numbers into perspective, just consider that the total cost of the Afghan war from 2002-2013 amounts to $7089 per American taxpayer (based on the number of income tax returns). More revealing is the fact that the annual expenditure rate under the Bush administration was already $222 per taxpayer. Then, it exploded to an annual expenditure rate of $1329 per taxpayer under President Obama. In addition to laying out the phenomenal spending magnitudes on President Obama's watch, del Castillo demonstrates just how unsustainable all this Afghan spending is. For example, in 2013, the United States financed over $5 billion of the $6.5 billion needed to field the Afghan National Security Forces. This $5 billion of U.S. financing was roughly 10 times more than the Afghan government actually spent from its own revenue sources. In fact, the U.S. funding of Afghan forces was almost three times the total revenue collected by the Afghan government. To put Afghanistan's financing gap into perspective, the Afghan government estimates the total fiscal deficiency that they will face over the next decade would amount to a whopping $120 billion. Considering that a July 2013 Washington Post/ABC poll showed that only 28 percent of Americans say the war in Afghanistan has been worth the cost, it is unlikely that the U.S. would even contemplate continuing to finance the house of cards it has built at anything close to these estimates. And if this isn't bad enough, consider that the countryside has been forgotten and neglected during the war years. It is here where 75-80 percent of the population resides, and produces its livelihood. The rural population has done what is only natural -- farm a cash crop. And, the most attractive cash crop in Afghanistan is poppies. Not surprisingly, the poppy plantations have greatly expanded, from 75,000 hectares in 2002 (near the start of the war), to over 210 thousand in 2013, surpassing the previous peak of 190 thousand hectares in 2007. Just another small example of the collateral damage associated with war and misguided economic policies in Afghanistan.